Bulgaria's economy and energy minister Traicho Traikov (front) and education minister Sergey Ignatov (back, yellow shirt) are seen at Saturday's bicycle trip organized by Bulgarian students. Photo by BGNES. Bulgarian university students gathered in the center of Sofia Saturday morning to start the traditional bicycle trip marking the end of the academic year. Over 300 people gathered for the event, which involves a 20-km ride to nearby town of Bankya. Many of the students expressed dissatisfaction at the opportunities for commuting by bike in Sofia. The infrastructure of Bulgaria's capital has notorious problems which are getting worse with overcrowding. Among them is heavy traffic, few parking places for cars and virtually no bicycle lanes. At Saturday's events the students were joined by three members of the Bulgarian cabinet: Sergey Ignatov (minister of education), Traicho Traikov (minister of economy and energy) and Tomislav Donchev (EU-funds minister). 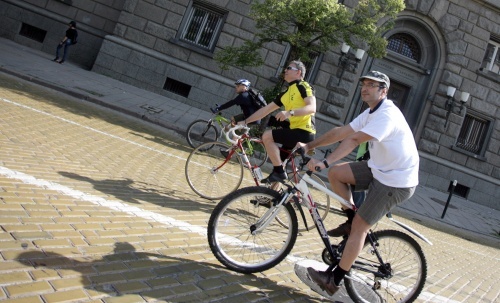 Peter Dikov (Sofia municipal urban architect) and Ivaylo Gabrovski (Bulgaria's best cyclist) also took part. The ministers were more favorable on Sofia's infrastructure for bike riding and expressed optimism about future prospects. Current Bulgarian PM Boyko Borisov has repeatedly claimed the designation of special bicycle lanes as an achievement of his term as Sofia Mayor (2005-2009).